Need a few more bouquets or centerpieces? Click here! 1 Bridal Bouquet: 5-6 O’hara cream garden roses, 5-6 Pink Mondial, 3-4 cream spray roses, 5-7 cream ranunculus, heavy base of olive branch and seeded eucalyptus. 4-5 BridesMaid Bouqets: 1 O’hara cream garden roses, 3 Pink Mondial, 2 cream spray roses, 2-3 cream ranunculus, heavy base of olive branch and seeded eucalyptus. Bouts or Corsages: I average 1-2 spray rose buds per bout, and 3 buds per corsage. Add sprigs of your favorite green! I like to save a ranunculus for the groom's bout to make his special! 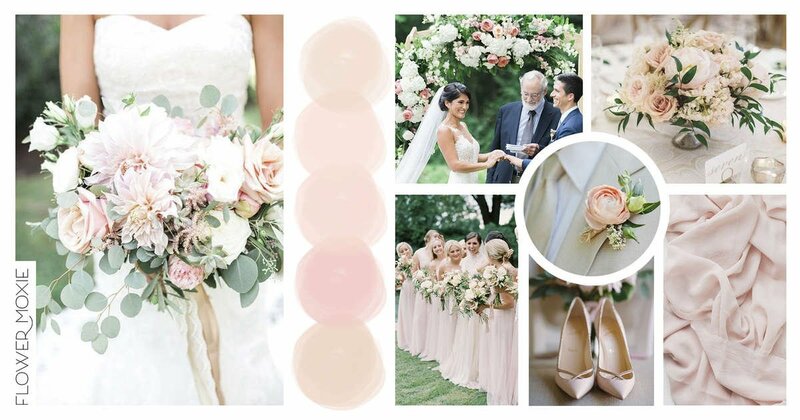 Here's our Blush and Cream Pinterest Board that inspired this combination of flowers. We hand-selected predictable and year-round flowers that will be easy to work with and give you the same or similar vibe that's happening within these moodboards to take the guess-work out of it! The Pinterest Inspo links are not an exact replica but a great visual image of similar colors and flowers pulled together to help with the "...but what's it all gonna look like together?" question.